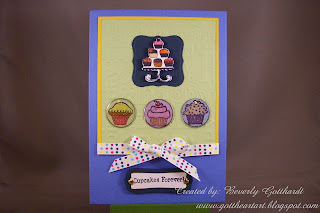 Gott Heart Art: Cupcakes Forever! Wow, 2 cards before midnight, a record for me, I believe. I made up my own colors on this one, and used Mary Jo's TSSC92 sketch over at http://technostamper.blogspot.com , she's on my list of favs, check her out, very talented and generous lady. I think this will work for some of my guy birthdays. Closing up for the night, getting hubby off to work. Tomorrow is a big day, I've got my confidence up, I'm going to get some cards ready and send in to a couple of magazines, I might accidentally get published, so in 2010 you might hear and see a very excited lady. Supplies: Card Blank: 51/4" X 71/4" Value Pack Hobby Lobby, papers from my stash, Cuttlebug Embossing Folder: Happy Birthday, Spellbinders Nestabilities: Labels One, Inks: Ranger Archival Ink: Jet Black, Marvy Le Plume marker: pale orange, Stampin Up marker: crushed curry, CTMH markers: blush, taffy, crystal blue, cranberry, sunny yellow, petal, parchment, outdoor denim, bubblegum, baby pink, brown bag, sorbet, orange, Stamps: Studio G Clear Stamps: VC0004 Series 27, Paper Studio Spare Parts: mini heart brads, Paper Studio: Bubble-A-Bilities, EK Success: 1" circle punch, EK Success Stampin Up: modern label punch, ribbon: Hobby Lobby, pop dots. Wow, this is great! What a fun birthday card, the colors are great! Thanks so much for playing along. And thanks for the kind comments too!